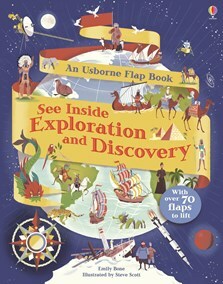 Journey into the unknown with real-life explorers from times gone by, in this fascinating lift-the-flap history book. Features some of the most famous and daring explorers and missions from history, including Marco Polo's journey from Italy to China in 1271, Christopher Columbus' discovery of the 'New World', the new frontiers of space exploration and lots more. With over 70 flaps to lift to reveal facts such as who the first explorers were, how the Ancient Greeks drew early maps of the world and the places that brave men and women are still exploring today. A compelling book for young explorers, full of fascinating history, geography and adventure. Every page is full of detailed pictures which children will enjoy and which will increase their knowledge and understanding of this fascinating topic. It's great to support school work too. The first thing that always strikes us about the ‘See Inside’ series is the beautiful presentation. The books are hard-backed, colourful and extremely well illustrated – this latest addition is no different - a wonderful non-fiction title which is guaranteed to enthrall young readers.